Router tables are exceedingly popular and can be found in most shops. 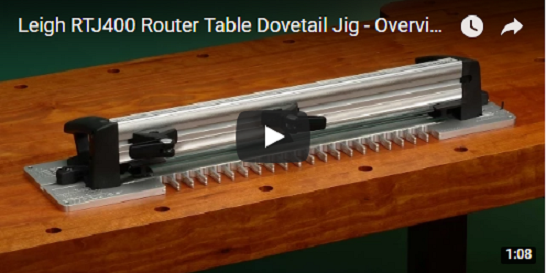 The Leigh RTJ400 Router Table Dovetail Jig is designed specifically for router table use, providing fast and accurate routing of through dovetails, box joints and half-blind dovetails, all on your router table. The Leigh RTJ400 Template is precision CNC machined from aircraft grade aluminum for perfect joinery every time. Create all this joinery on one Jig. Versatility is a key feature of the Leigh 16"(400mm) RTJ400 Jig. It makes 5 sizes of through dovetails at two different pitches, 3 sizes of single pass half-blind dovetails, and 4 sizes of box joints (finger joints). Perfect joint fit is guaranteed and repeatable with the patented Leigh elliptical guide bushing. 5 joint (pin) sizes: 1/4", 5/16", 3/8", 7/16" and 1/2"
4 joint (pin) sizes: 1/4", 5/16", 3/8"and 7/16"
3 joint sizes: 3/8", 1/2", 19/32"
Four joint sizes, 3/4", 3/8", 3/16" and 3/32"
The Leigh RTJ400 Dovetail Jig makes precise joinery easy. Simply center the board on the template and guide the jig across the router table to rout the joints. One template makes all three types of joinery. The Leigh RTJ400 is a dedicated router table dovetail jig, designed for use by woodworkers of all levels. Leigh has made perfect joinery easy in every way, from the clearly illustrated, step-by-step user guides, complete how-to videos on the included DVD, to customer service that's second to none, with instant toll-free technical support and help line. Router tables are typically used with a bearing or fence, however, the Leigh RTJ400 is guided around a guide bushing mounted in the router table. Leigh eBushes (guide bushings) are designed around the decades-old Porter Cable/Black & Decker industry standard. Therefore, you will need an insert ring to fit the eBush to your router table or router plate. See specifications below. To fit the eBush to your router table insert plate, you need a 1-3/8" diameter counter bore insert ring. Check with your router table or router plate (router lift) manufacturer, as to what adaptation, if any, is required.